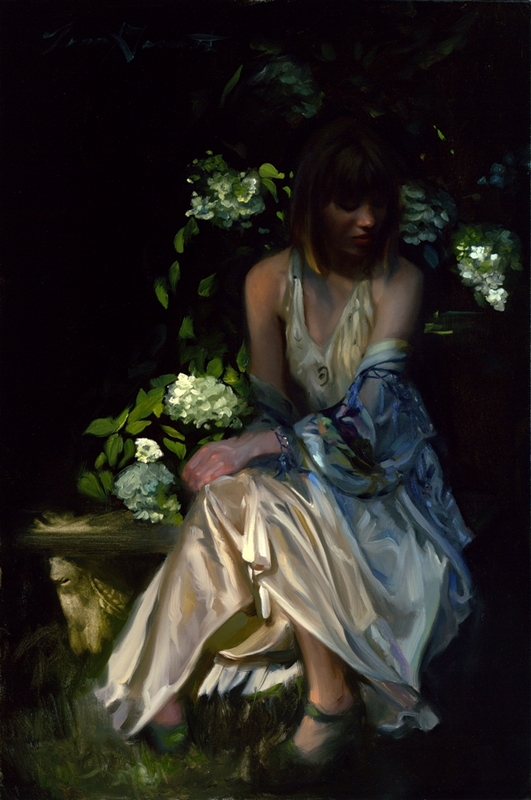 In 2012, based on her self-taught pastel portraiture, the Scottsdale Artists’ School awarded Tina the first of two merit scholarships she would receive, and she began learning to oil paint after a decade as a freelance children’s illustrator. In the few short years since Tina’s introduction to oil painting, she has studied intently and been heavily influenced by the Selective Start Method described in Alla Prima by Living Master Artist and Author Richard Schmid. 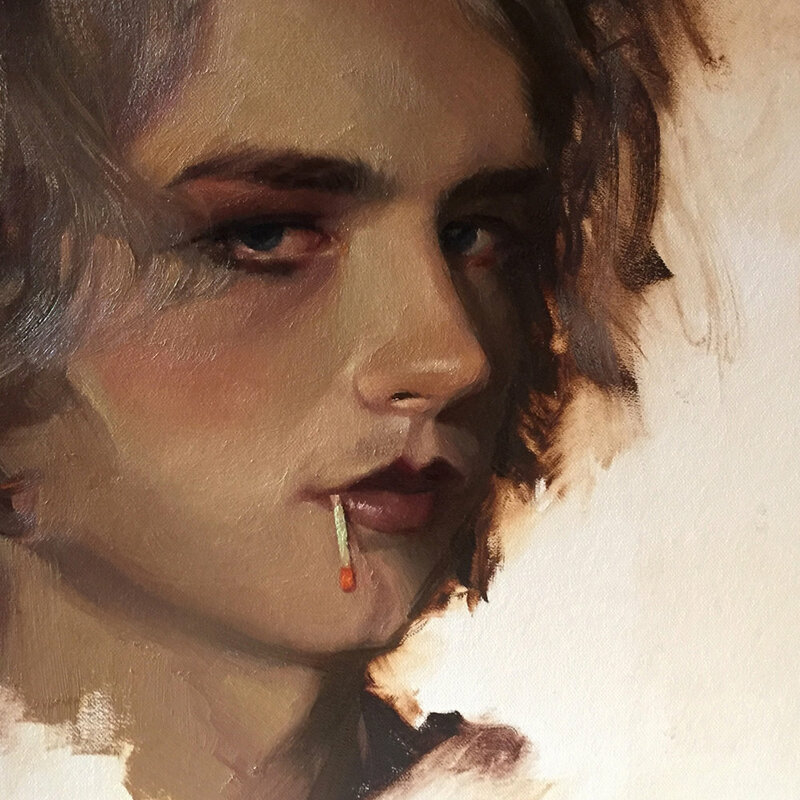 Tina subsequently studied in workshops offered by Richard’s students whenever possible, including Romel de la Torre, Casey Baugh, Aaron Westerberg, Kathy Anderson, Jeremy Lipking, Tim Deibler, Michelle Dunaway, and Stanka Kordic. 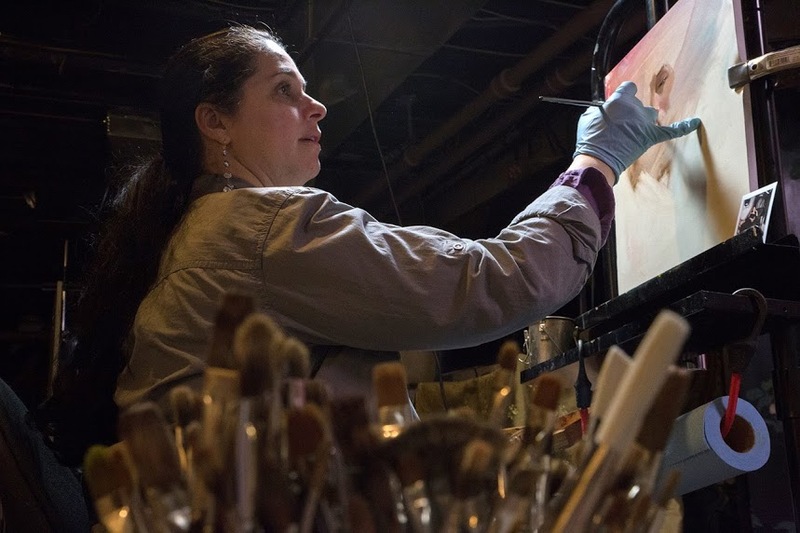 Tina is one of few master painters teaching the Selective Start Method and can be found painting and teaching private lessons at her Lee’s Summit, Missouri studio, and teaches workshops and mentors artists across the U.S., U.K and in Italy. Tina is proud to accept a Master Artist designation through the National Oil and Acrylic Painters’ Society Signature Member Guild and an ARC Associate Living Master designation by the Art Renewal Center. I started my career as a freelance graphic designer and illustrator, and so when I began learning how to oil paint in 2012, I had a jump start on understanding design, composition, color theory, drawing, and all the business aspects of working for myself as a professional artist. The third painting I ever painted exhibited in the 2013 Best and The Brightest Exhibit at the Scottsdale Artists School juried by Casey Baugh. I’ve since had works exhibit in shows across the country and in Europe, such as the Salmagundi Club in New York City and The Museum of Modern Art in Europe (MEAM) in Barcelona, Spain. My works have received many recognitions including two ARC Salon Purchase Awards from the Art Renewal Center, an International Artists Magazine Grand Prize for People and Figures, a First Prize Oil Painters of America Online Showcase, a People’s Choice Award at the Annual Best of America Exhibit for the National Oil and Acrylic Painters’ Society, and a Seventh Honorable Mention from the Portrait Society of America’s Members Only competition. Two of my works are in the ARC permanent collection. My finished works have sold in the $4K to $12K range. How much time is dedicated to the execution of the work before you actually start the process? How much time does it take you to create an artwork? I spend a great deal of time working on the painting concept before any paint touches the canvas. It can be months or a year. I’ll do photography, collage, sketches, etc. all to get the problems in the process solved before I begin painting wet into wet. I sometimes make a simple monochrome or color wash underpainting that is obliterated by the color above in one pass of wet into wet—it all depends on how complex the composition is. My finished pieces take nine to thirty days of actual painting time. I sold a $7k painting and two works in the $2k range recently, one from a gallery where the painting was on exhibition at a competition and one through a buyer on Facebook. I have a patron who orders 2 commissions a year and I paint an additional 1 commission a year. I paint rather large and rather slowly. In a typical year, I’ll paint 10 large paintings. I’ve sold nearly everything I’ve ever painted since I started in 2012. I think I have just 3 paintings that have not sold and are not the paintings I’ve been recently producing for my upcoming solo show. Is the work a part of a series? Yes, String of Pearls is part of a series. The first paintings I was recognized for were all part of a series called Vintage est Nouveau, which means What’s Old is New. They were figurative works inspired by clothing from the 1920s. I enjoy painting series because I tend to get bored of a subject, bored of a palette and I enjoy switching series to satiate my interests. Do you ever venture out of your creative process to try out new ideas? Yes, I do venture outside of my normal processes. I’m constantly experimenting and learning new approaches, and because of my need for that, I swap painting in at least three different processes. The first is an open grisaille, which is a monochrome under-paint and that allows me to workout drawing, value and edges issues before I add color. The next is an accurate color wash, which I tend to use when painting from life or painting a vignette, and then the third is selective start, which is my favorite, and you can see in the images here that I begin in one specific place and build one brush stroke on to the next in the correct shape, color, size, edge, etc. I’m excited to release my first instructional video on painting selective start from photos, hopefully by the end of this year. That’s a tough question. I think if I can be a lifelong painter, if I can incorporate life as my profession for the rest of my life, that process will really be a treasure to me, instead of the end product being the ultimate goal. I feel like in terms of recognition, having pieces in the ARC collection, and having shown in some of the most beautiful, prestigious art venues around the world, in a way I feel what else could I ask for. I’m so thankful to get to be an artist for a living and to pay it forward when I teach and mentor. What are you trying to express, or where do you see yourself going, with your body of work? I’m working on my first solo show. It has made me be introspective and critical of the work I’ve done. I’ve discovered some uncomfortable places and I'm trying to challenge myself to be more vulnerable in my subject matter, and also to remember that I’m the only person that I have to please in my work. Those two worlds are colliding. In terms of where I see my work going, I think it is similar for every artist. There are peaks and valleys of great understanding and great confidence, and then absolute depression, and then climbing back up to the peak again when you challenge yourself or learn something new. I see my work expanding in complexity, in terms of design—more figures in each piece, different sizes. In terms of narrative, I really like to keep that a secret. I don’t want my work to depend on a written explanation to know what it means. I love it when the narrative comes from the viewer and when I hear a person say what they have found in my work is a gift to me. It is different with each person, and for me it is much more interactive than me just telling the viewer, here, read this, that’s what I wanted you to see in my work. Be brave. Be authentic. Be unapologetic. This last bit is especially important for female artists, who in my experience, are challenged more often than male artists to explain and or justify their work. I’m working on a set of 9 12” × 12” vignettes for my upcoming show opening March 1st, 2019, at the Bountiful Davis Art Center in Salt Lake City, Utah.